← Mill Creek announces “90s Retro” Blu-rays for 90s hits! M Night Shyamalan’s Unbreakable trilogy wraps with Glass – and if you didn’t see it in theaters, now’s your chance to catch it on Blu-ray! Heck, if you saw it in theaters and loved it, here’s your chance to own it on Blu-ray! I’ve got ten copies I can give away, and y’know what? I’m gonna. How, you ask? Okay, still with me after the jump? Cool! Because it’s DOUBLE CONTEST TIME Y’ALL! That’s right. Two ways to win! First: five mailing winners. Send me an e-mail at editor@atomicfangirl.com with the subject line “DUDE DO YOU EVEN SUPERPOWER?” and in the body of the message tell me what superpower you’d love to have. Write your name and mailing address too, in case you’re one of the five mailing winners. CONTEST OPEN TO US ADDRESSES ONLY. SORRY ABOUT THAT BUT AIRMAIL IS A BUGGER. You’ve got until Friday, April 5th to enter. Second: Hands out! As my locals know, I tend to hit area screenings. So I’ll be hinting on the AFan FB page when I’ll have a copy of Glass on me. One copy per screening. First person who asks me what superpower I’d like to have gets the copy. Only one copy per person, so no winning more than one copy. Don’t be grabby-hands y’all. Share the love. And no, you don’t have to have tix to the screening. You can show up to the theater area and see if you catch my eye. I tend to wander a bit around the line for screenings whenever I have a contest. So if you see me, just say hello! There’s no deadline for this part of the contest. Just keep an eye peeled on the AFan FB page. And yes, I’ll be counting down (ex: “I’ll be at [MOVIE SCREENING] with Copy #1 of the Glass giveaway!”) on the FB page, so you know how many I’ve got left! Tada! And good luck, everyone! 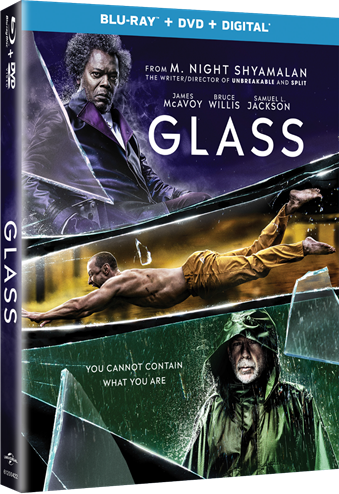 1 Response to Blu-ray Giveaway: “Glass”!